Coiffure 1er Republique. 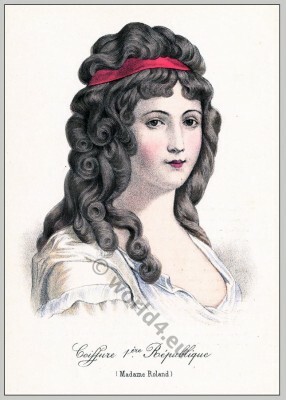 Madame Roland 1792. Home » Coiffure 1er Republique. Madame Roland 1792. Coiffure 1er Republique. Madame Roland. Hair Fashion during the First French Republic. Jeanne-Marie Roland de La Platière, better known as Madame Roland 1754-1793 (died by the guillotine), was a political figure in the French Revolution, which resulted in a salon in Paris. In prison, she wrote her Appel à l’impartiale postérité, their daughter Eudora dedicated memoirs (Free Ebook). Première République française. Source: Album de coiffures histories by E. Nissy. Published 1890 by Albert Brunet. This entry was posted in 1792, Directoire, France, Hairstyle, Headdresses, Merveilleuses and tagged French Directoire style, French Revolution Costume on 6/15/13 by world4.